Finally, I can hug "Him". 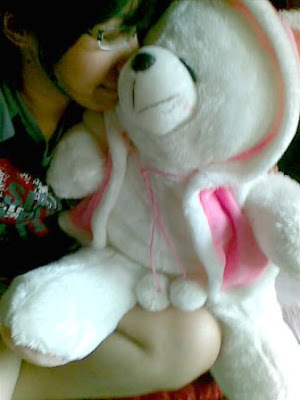 my lovely White Bear Doll. From a very special person in my life. Actually the doll has not a name yet...could you help me to give a name for "him", please???? 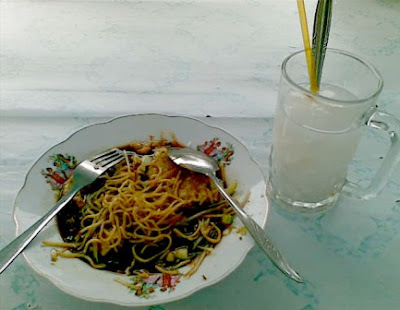 tried my favourite food when I was at Senior High School at Jambi city. The Food called: "Lenggang "(filled with noodle, mpek- mpek (made from flour mixed with fish) then fried with egg. the drink called: "Coconut Ice"
I think michelle's suggestion is not bad.. but I give you a special rights to name the doll.. what do you think..?